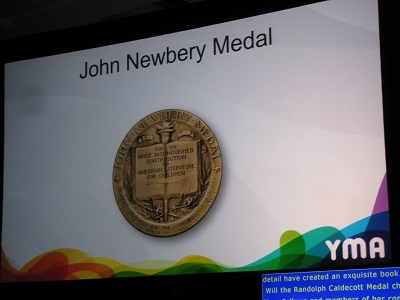 Sonderbooks » Blog Archive » Newbery Notes – Choosing the Winner! 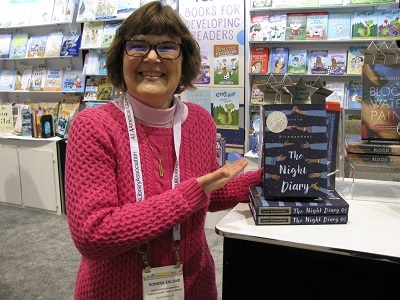 Newbery Notes – Choosing the Winner! 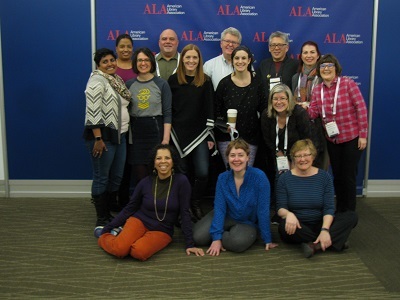 I’m back from ALA 2019 Midwinter Meeting in Seattle – and the culmination of more than a year of work on the Newbery committee! So it’s time to give some last notes about the process. The content of our discussions is top secret, and I can never reveal what was said. But an outline of how things went is fine. I arrived on Thursday, January 24. That evening, those of us who were there met for dinner. We learned that we were down one person, so only 14 of us would be deliberating. But we did learn that the member who’d had a baby the previous Saturday was still going to make it! She left her baby with her husband and mother and was coming only the minimum possible time, leaving Sunday before the announcement. Friday morning, we met in a locked room beginning at 8:00 am. ALSC sent a copy of all the nominated books in a locked trunk. 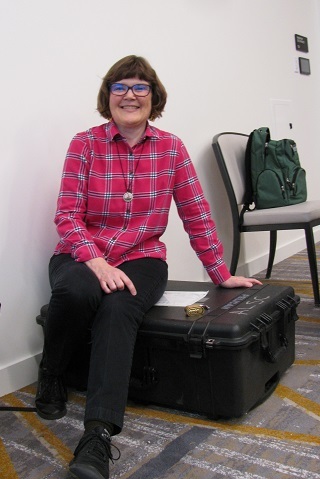 Only our chair, Ellen Riordan, had the key. We put all the books on the table. Our mission that first day was to reduce the number. We did discuss all the books. Then we decided which ones to eliminate. I wasn’t actually well-prepared for that step. It is in the manual — but the procedure isn’t as defined ahead of time, so I had overlooked it. It was hard to let some of the books go, though we made clear that we honored all of the books and appreciated what wonderful books they were. In fact, some of us channeled Marie Kondo and thanked the books as we put them back in the trunk. 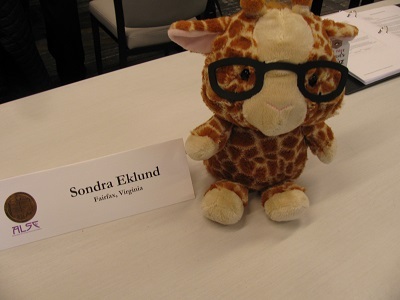 Fortunately, we had a Deliberation Giraffe on hand to hug when we were mourning the departure of a loved book. The next day, we had far fewer books to discuss. Again, I can’t say how many. But discuss them we did! In much greater detail than the day before. And eventually, we made our choice. It was not easy, and we were there from 8:00 am to 9:00 pm. We ordered lunch in and only had a short break for dinner. But before the day was done — we had chosen a winner and two honor books. The next day, we wrote our press releases. We put stickers on the winning books and took them to the ALA Press Office, heavily wrapped up. I loved the “Ooooo” that came out of the woman who received the books. 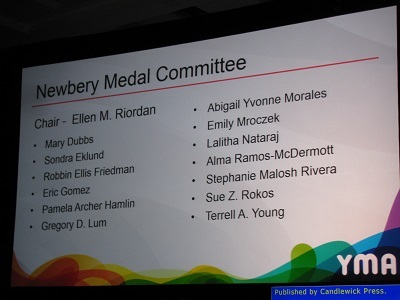 We got a picture of the full committee including Emily, who was going home to her baby that evening. Then Monday was the day of celebration, the reward for all our labor. 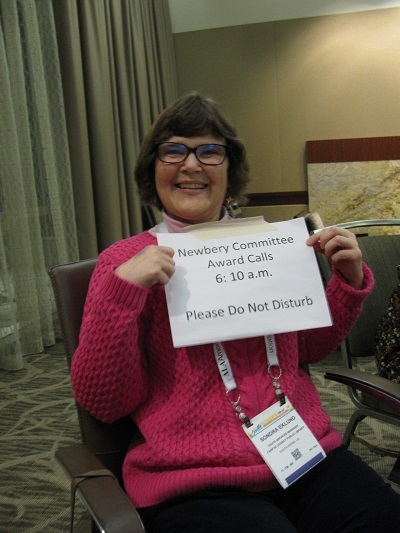 We arrived at 5:50 am to call the winning authors. I was very glad to still be on east coast time! They first put us in a tiny closet, but the phone there didn’t work, so they moved us to a beautiful conference room. We called all the authors and got to hear the moment when their lives changed. (We didn’t consider this, but I loved it that all three are first-time honorees.) 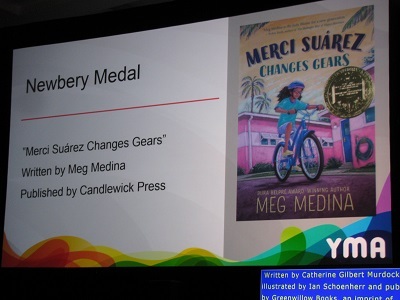 It took three tries to reach Meg Medina, the Medal winner, and she was heart-touchingly eloquent, so thankful, realizing that there’s not much separating all the books, and so happy that we loved Merci, and excited for what this would mean to Latino girls and boys. 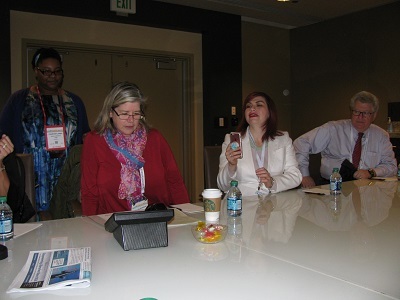 The wonderful thing about the conference room was that we stayed there after the phone calls were done. Many times during the process, Ellen had gone around the room and asked us how we were feeling. We did that one more time — and it was especially meaningful, talking about the journey we’d been on all year. Some members of the committee had an especially challenging year, and we were so glad they made it through. (We were missing the two who started the journey but weren’t able to finish, even though the person who stepped into the gap had done a fine job.) Ellen expressed appreciation to each one of us, and we were all feeling so thankful to be part of this distinguished group of people. 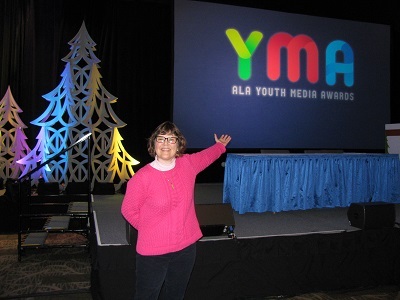 Then came the Youth Media Awards, beginning at 8:00, when all the awards were announced, Newbery last. Remember how I was sad to see books go earlier? Well, the Youth Media Awards really mitigated that sadness. Remember that we read lots and lots of children’s and young adult books this year. 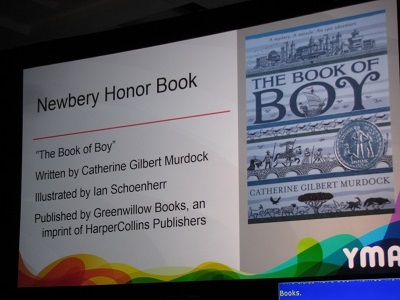 That meant that a huge percentage of books that won awards — for both children’s and young adult — were books we had read and loved. 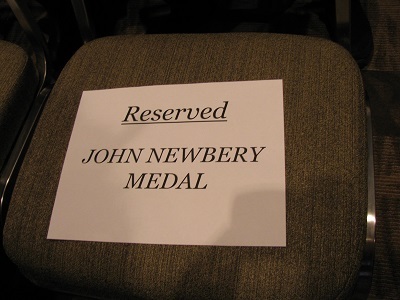 And also a very high percentage were ones we had seriously considered for the Newbery. And, yes, some were ones I was personally a bit sad had not been chosen by us — and seeing them win other awards mitigated that sadness. Yay! Just because they weren’t in our committee’s top three didn’t mean they weren’t magnificent books. This year there weren’t a lot of books that got multiple awards. And that made me happy. It shows that there were many wonderful books published this year and lots and lots of book love to spread around. In fact, our winners didn’t get any other awards — which makes me all the more glad they were chosen by us. 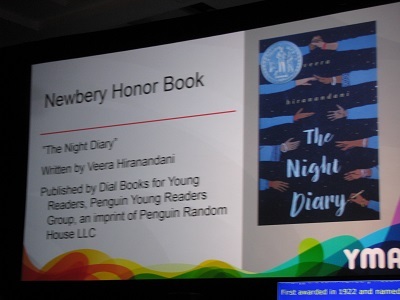 And finally came the moment we’d been waiting for — the announcement of the winner of the 2019 John Newbery Medal and two honor books. 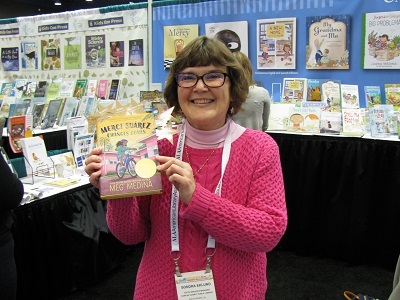 After the announcement, I went to the publishers’ booths in the exhibit hall and got pictures with “our” winners. I am so happy about our choices! 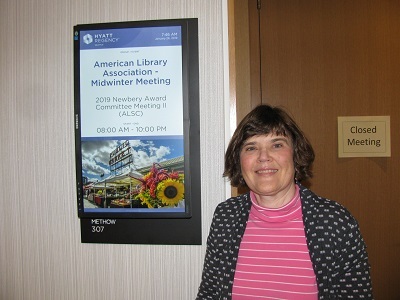 And looking forward to the banquet in June in Washington, D.C., when the awards will be presented and we’ll get to meet the authors. 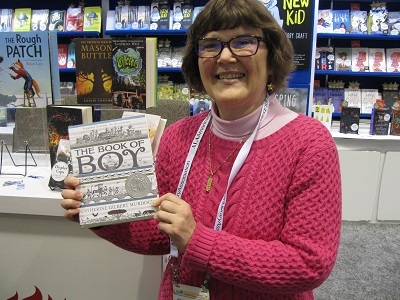 This entry was posted on Thursday, February 7th, 2019 at 1:22 am and is filed under Newbery Notes. You can follow any responses to this entry through the RSS 2.0 feed. You can leave a response, or trackback from your own site. Thank you for this description of the process- very interesting! I am glad to hear that so many of the books you loved won awards. It sounds like an amazing experience, Sondy! Thank you for sharing it with us. Yes! It truly was! And my pleasure to get to talk a *little* bit about it!